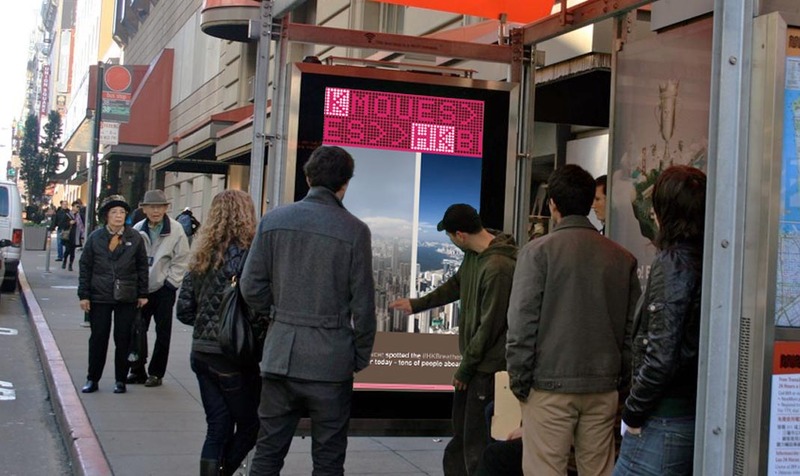 A branded advertising campaign for the City of Hong Kong created in conjunction with Tisha Boonyawatana, Charisse Panganiban, Baktaash Sorkhabi, and Satsuki Atsumi. 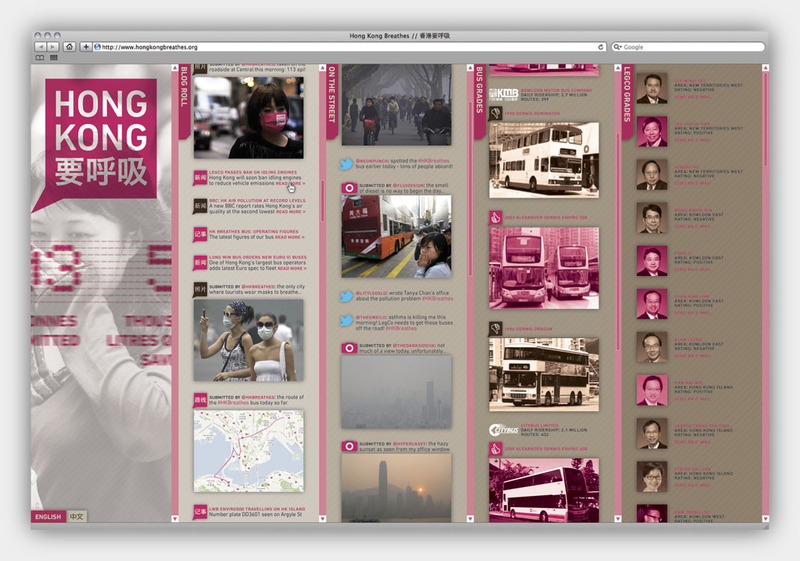 Problem: Buses in Hong Kong are major producers of road-side smog. Many running are pre-Euro or Euro I–III, thus have already exceeded their depreciation age. The people, the government and the bus companies are all aware of the problem, but action to replace or otherwise retrofit these vehicles to be cleaner running is slow moving. Solution: Show the people of Hong Kong how eco-friendly public transport is indeed a possibility within their reach. Method: We realized early on that this is too big a problem to tackle head-on and solve in one go, so we devised a multi-pronged media and grassroots campaign to get the people of Hong Kong talking about the problem and its solutions – our goal is simply to start the conversation. Branding: The brand mark is a way of speaking without speaking; a form of silent protest. In this way, we are being mindful of Chinese culture in that our brand is bold without being vulgar. It is earnest but respectful – a way for the people of Hong Kong to speak up without necessarily speaking out. The brand is comprised of two polarities, one being Hong Kong Fuchsia, the other being Smog Brown, each of these colors representing both the positive and negative aspects of Hong Kong’s air – HK Fuchsia (whose color is derived from the Hong Kong Orchid) speaking to the spirit of Hong Kong and her people’s wish for a cleaner city; Smog Brown being what the people of Hong Kong are actually breathing. Street Campaign: We would first begin with a street level awareness campaign using stickers and pollution masks. In this way, we allow the people of Hong Kong to have their voices heard in a visible, public manner. 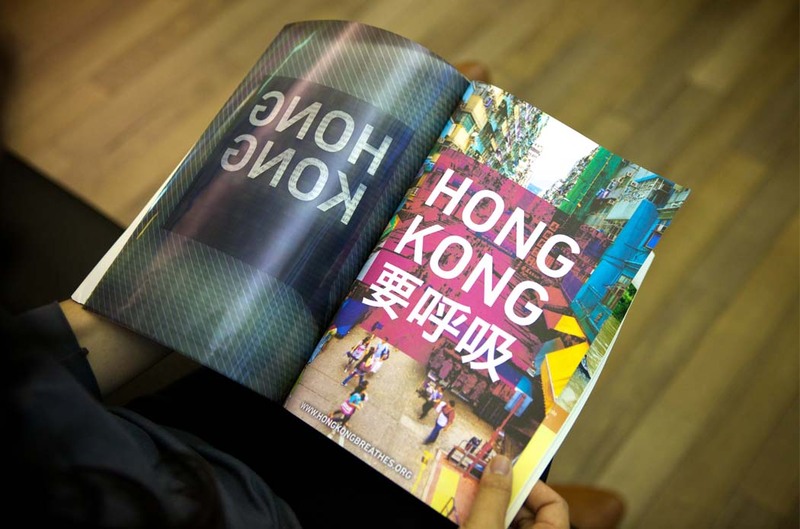 The mark itself literally translates to “Hong Kong Wants to Breathe,” but the omission of an object at the end leaves the phrase unfinished and open to interpretation, which can be seen in the sticker applications of the brand mark. 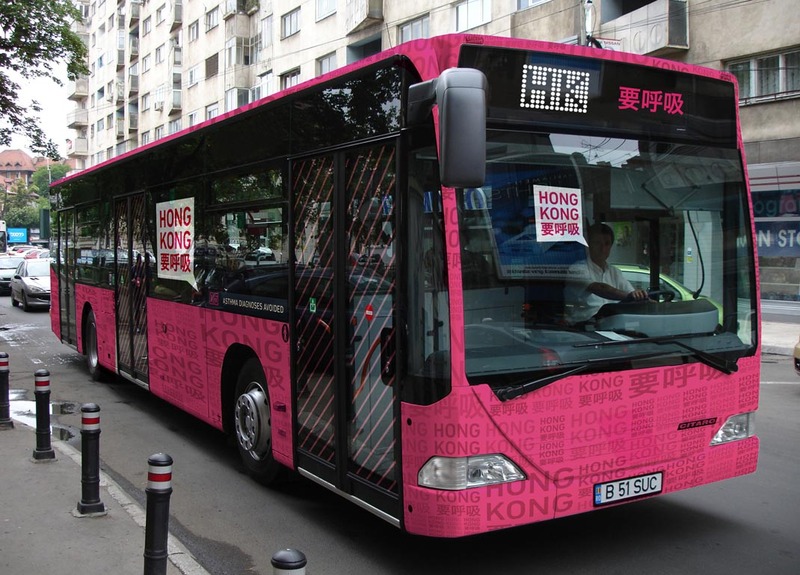 The stickers could also serve as an informal rating system of buses in Hong Kong – citizens would put a sticker either in HK Fuchsia or Smog Brown on a bus, indicating whether it is a clean-running bus or one that should be retired, respectively. Concurrently, we would also begin distributing smog masks bearing the campaign logo, allowing the people of Hong Kong to quite literally speak without speaking – a protest that is silent but not invisible. Website: The campaign’s website would become a hub for content both generated by the campaign itself as well as user submitted content. 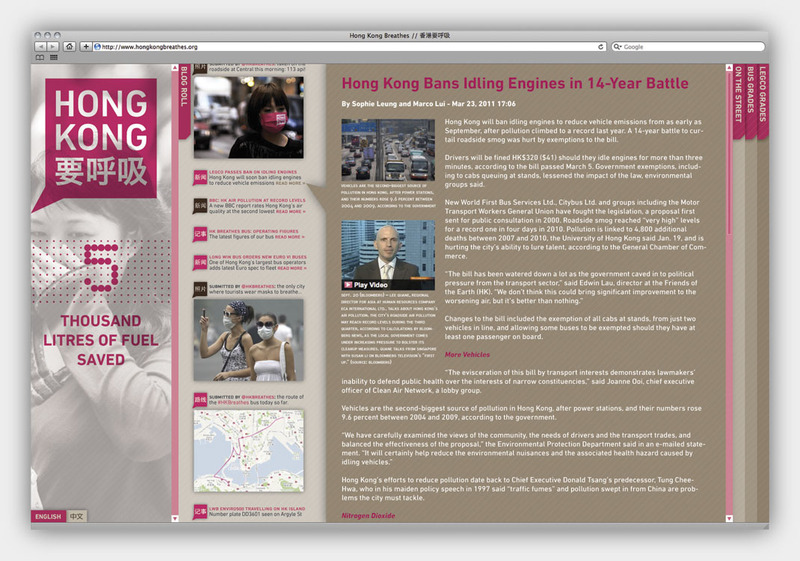 From left to right, the website would feature: a ticker highlighting the gains that the campaign has been able to generate through both awareness and more active means (which will be explained in a bit); a blog-roll of content from the campaign itself; user submitted photos, tweets, and news stories; a rating system for the bus companies in Hong Kong and their fleets, the tint of which indicates its environmental friendliness (HK Fuchsia being a positive rating, Smog Brown being negative); and a list of all the politicians in Hong Kong’s Legislative Council and their environmental ratings. In this layout the campaign is on the left-hand side, and the bus companies and government on the right-hand side – the people, and their voices, are square in the middle. 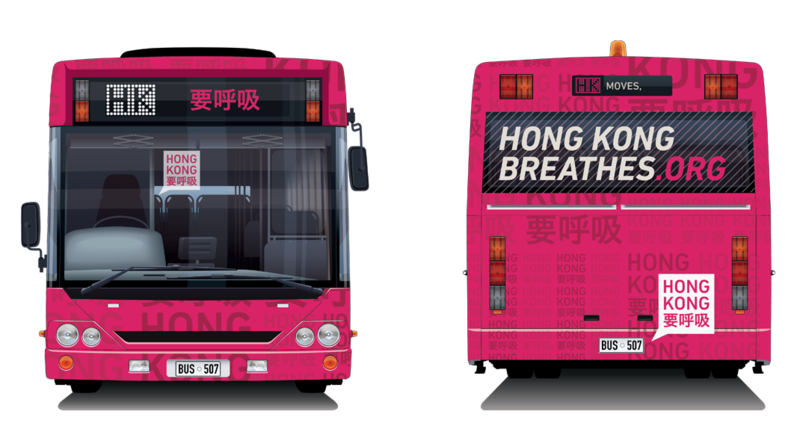 Ride HK: A cornerstone in demonstrating a cleaner, greener Hong Kong is Ride HK, in which several of the newest, cleanest running hybrid city buses would be brought over to Hong Kong. Branded in the campaign livery, these buses would shadow the routes of some of the dirtiest running buses in Hong Kong, offering up rides for free or for any donation amount that riders are willing to give. The routes that these buses would run would change day by day, with no set route. 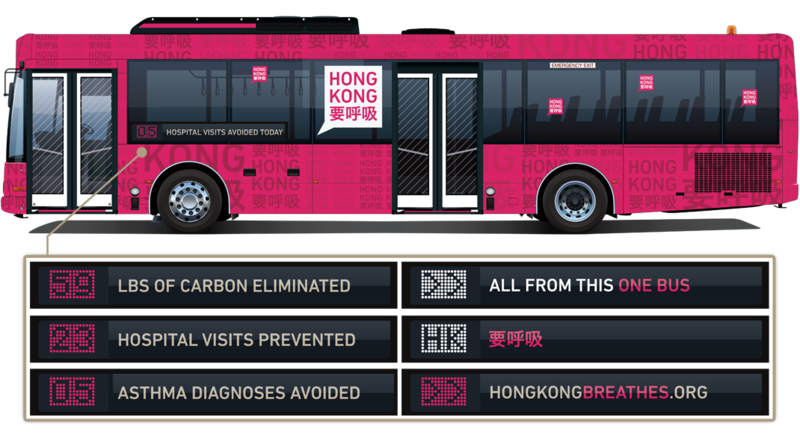 As such, the route ticker – instead of showing route information – would show health and environmental information that the running of this bus – as opposed to a normal bus – is achieving; the interiors of the buses would also show similar facts and figures. Also in the interior would be TV panels displaying live content being served from the HK Breathes website. We would also deploy interactive, touch-based panels at bus-stop shelters in which tweets and photos – again from the website – would be displayed. 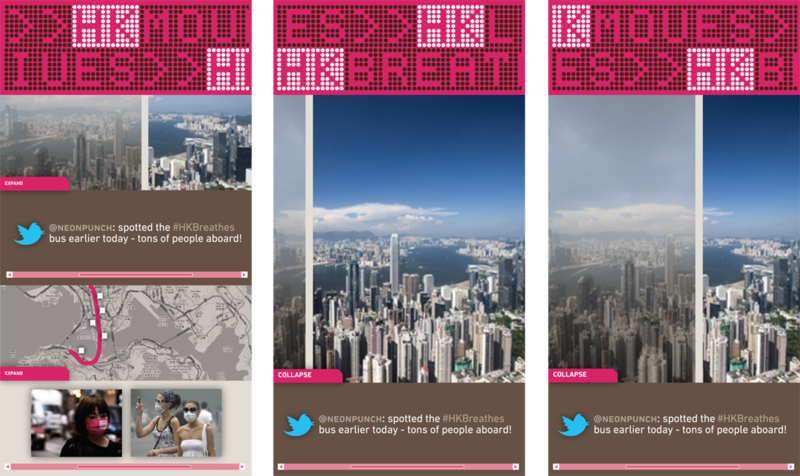 These bus-stop installations would also show a feature dubbed View HK, in which users would submit their photos of the smoggy Hong Kong skyline to the HK Breathes website. 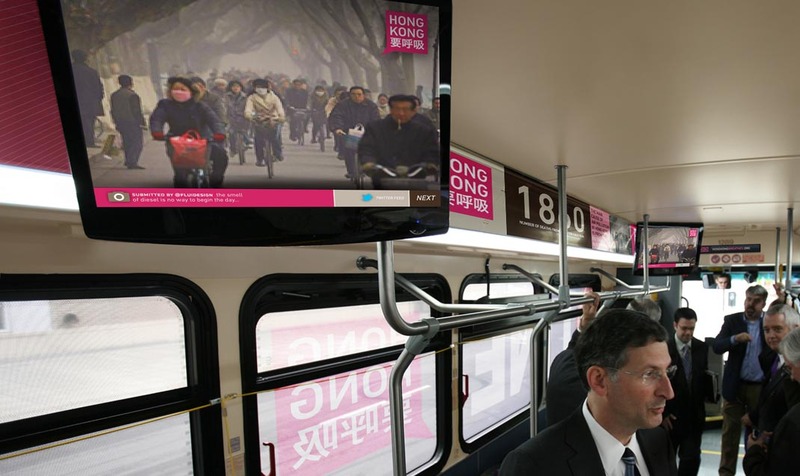 We would then take these photos and edit them to show the citizens of Hong Kong how their city could look; patrons waiting for a bus would be able to swipe a split-screen display, toggling between the two views of Hong Kong. iPhone Application: Also served up from the website would be content for our iPhone application. This application would provide the facts and figures relating to Hong Kong’s pollution problem, and would be able to send a direct e-mail message to their representative in the Legislative Council. 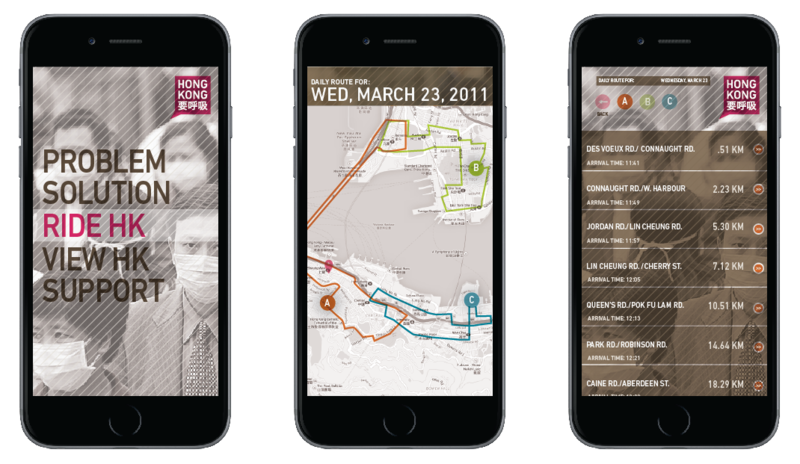 Users could access the current routes of all the Ride HK buses, and see where the stops for the day will be. 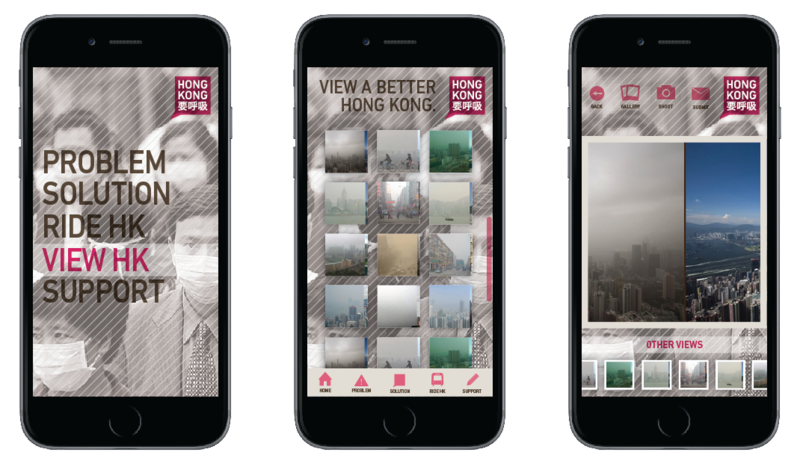 They could also see photos that users have submitted for View HK, as well as capture and send in their own shots to be featured on the HK Breathes website. 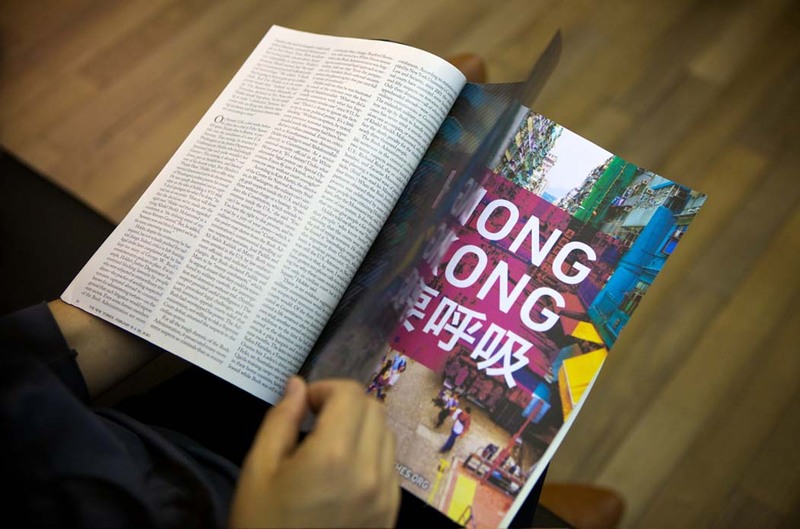 Traditional Ads: Rounding the campaign out would be traditional media in print, as well as on street-side displays and in MTR (subway) stations. 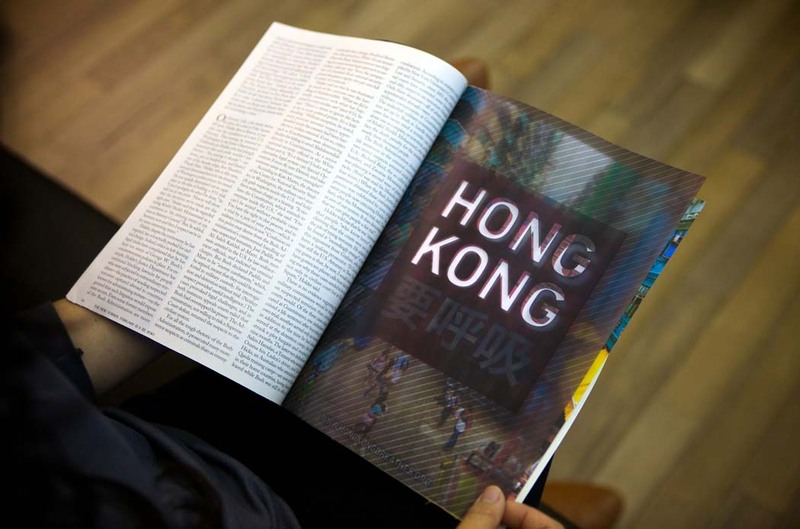 In all of these ads, viewers would see a progression from dirty, muddled views of Hong Kong to bright, vibrant vistas of their city – print ads would employ transparencies, while street-side and MTR ads would leverage lenticular techniques.